Heat oven to 350°F. Line 8-inch pan with cooking parchment paper, or grease well. 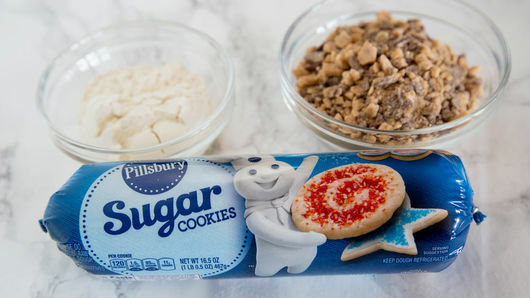 In large bowl, break apart 1 roll (16.5 oz) Pillsbury™ refrigerated sugar cookies. Add 1/4 cup all-purpose flour and 1 cup toffee bits. Mix until well combined. Press in pan. Bake 30 to 35 minutes or until golden and toothpick inserted in center comes out mostly clean. Cool slightly. 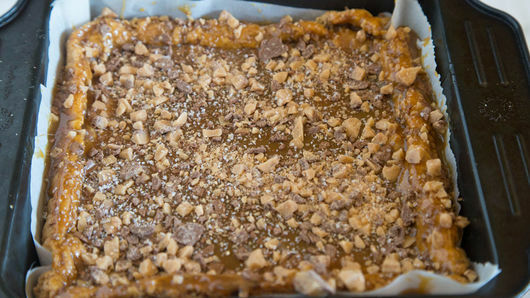 Pour 1/2 cup caramel sauce over blondies; spread evenly. Sprinkle with 1/3 cup toffee bits and 1 teaspoon sea salt. Cool completely before cutting, about 30 minutes. Cut into 4 rows by 3 rows. For an over-the-top chocolate treat, use hot fudge instead of caramel sauce. To make Chocolate Chip Salted Caramel blondies, use Pillsbury™ chocolate chip cookies instead of sugar cookies. As you may have guessed, “blondies” are basically brownies without the cocoa. They keep the rich, dense decadence of their chocolate cousin with ingredients like vanilla, butter and brown sugar, and are served the same way in small squares. 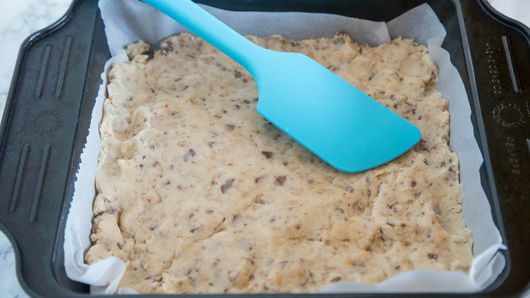 Many blondie recipes call for extra ingredients to sweeten things up even further—try adding chocolate chips, butterscotch chips, peanut butter chips or even toffee bits to the dough. 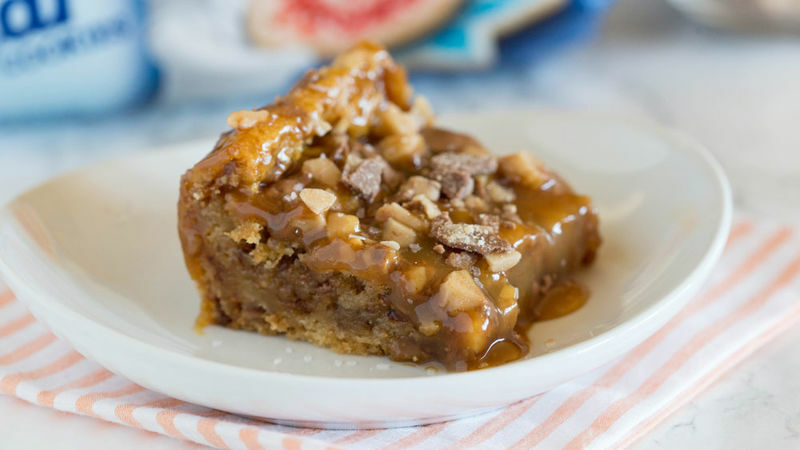 Or you can top with a salted caramel sauce like this tasty salted caramel blondies recipe. Are you more of a traditional brownie lover? Don’t worry! We have a lot of easy brownie recipes for you to make when a blondie just won’t cut it.